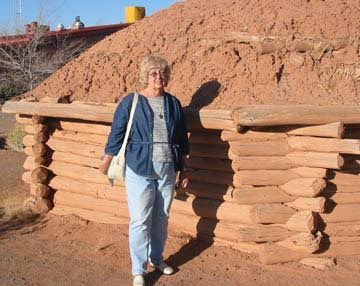 My husband took a photo of me below by a hogan that traditional Navahos lived in, made of mud and pine lumber, the door always faces the rising sun in the east and there is an stove pipe opening on the roof for the smoke to escape from the wood stove inside for cooking and heating. What a life our early native Americans lived. 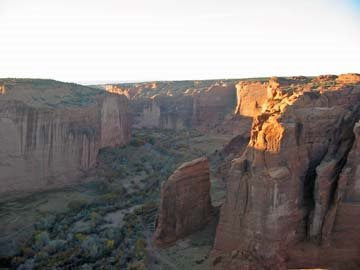 We drove to Canyon de Chelly near Chinle Arizona to see the cliff dwellings but they were far below us in a deep canyon built on ledges. (The last photo below shows some of their dwellings on a dark ledge, look on the middle right side of the photo.) We only saw them from up above, to walk through to them you either have to hike down then hike back up or hire a guide to drive you in the river bottom where it's closer to hike to them. Very beautiful! You share amazing pictures. Beautiful scenery, but it must have been a very difficult life for the native people. Nice that some of it is preserved for us to see now.. I remember being intrigued with the word hogan when we studied about the native peoples in elementary school. Now I can see an actual picture. I'm thinkin that date night to visit your cousin in the neighboring cliff dwelling was pretty much out of the question. I'm thinkin that once you finally got home, you'd want to stay there and wait for the millinium. Everything was so hard then. Growing your food...hiking to where you were growing your food, hiking to get the wood to cook your food and the water to wash up after cooking your food. Finding a spot to eliminate waste after digesting your food. Good grief!! Nothing was easy. I complain that I can't sleep on my king size posturpedic, temperpedic mattress under a cloud of down comforters while listening to the creek outside our bedroom window. They slept on a dusty, scratchy mat on the floor, with a dusty, scratchy blanket over them. Imagine what it would have been like to deliver a baby under their living conditions. And we're unhappy because the nurse doesn't serve rack of lamb and Red Velvet cake for lunch in the hospital. I'm signing off. I'm starting to feel like a spoiled brat. 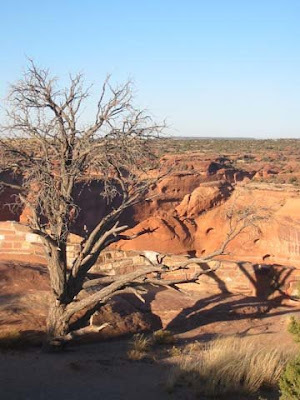 Wish we were with you exploring the landscape and history of Arizona. Another great post, Lin. I'm always anxious to get to the computer and see what new story or insight you have to share with us. Really terrific photos! What a gorgeous place Arizona is! Have always enjoyed my trips there, but always feel a sadness for the Indians, they had difficult times, particularly after "we" moved in and took over. Lovely pictures. I've been there too, it's awe-inspiring. We did the day long guided tour and BBQ lunch in the canyon. It was well worth it. We learned much about the culture. 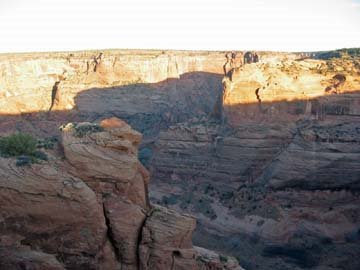 We were even serenaded by a Navajo with his flute - the beautiful echo coming off the canyon walls was haunting. Of course, we bought the cd. now those are some crazy dwelling places! what an adventurer you are! 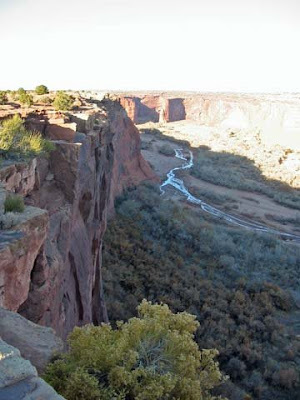 I can remember seeing cliff dwellings on one of our family vacations out west. I was very small, so I don't remember where we went. These photos are wonderful. I'm so interested in Native American history. Thanks for taking us along on your trip, Lin. It's fun for me to revisit that area again. I remember taking that trip with my children such a long time ago and loving it.